Spend a weekend in Little Rock this September, and launch an investing career that can last a lifetime. Jason Hartman’s Little Rock Investment Property Tour, kicking off this September 27-28 in Arkansas’ scenic capital, shows you how. That means $200 – $400 or more in passive income –every month. The Little Rock Investment Property Tour brings together experts from every area – lawyers, financial managers, accountants and real estate specialists – to give you the tools and support you need to launch your investing career in rental real estate. What’s more, you’ll get access to income-ready, turnkey properties you can purchase during the tour. The Tour’s early bird ticket price of $147 gets you all this, plus breakfast, lunch and dinner on Saturday and breakfast and lunch on Sunday. It doesn’t cover accommodations, though 00 but there’s a bonus: if you buy a property during the Tour, your ticket price is applied to the purchase. Real estate is the one investment that endures. It’s secure, tangible and always in demand, with both a current return on your investment and future appreciation. Everybody needs a place to live – and buying now and holding for the long-term lays the foundation for building wealth that endures for a lifetime. “Cast your bread upon the waters,’ says King Solomon in Ecclesiastes 11:1, “and you will find it after many days.” Investing in income property now can yield returns for the long term. 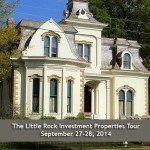 On one weekend in September, the Little Rock Investment Properties Tour shows you how. Get more information here. Should Bitcoins Buy Real Estate?